There are many commercial applications, which require a pressure difference between two rooms. We need to use differential pressure sensors for such applications. Examples are hospital rooms, pharmaceutical plants, clean rooms, isolation wards, laboratories, electronic manufacturing plants etc. Depending on the application, a room has to maintain a higher or lower pressure compared to the outside area. Technically, we call it as differential pressure. The room with higher pressure is having a positive pressure. Similarly, the room with lower pressure is at a negative pressure. We are supplying numerous types of differential pressure sensors for such applications. What is a Differential Pressure Sensor? As briefed above, when there is a difference in pressure between two rooms, it is known as differential pressure. 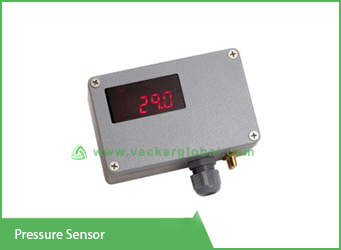 A sensor for constantly monitoring the difference in pressure is a differential pressure sensor. There is a central control unit, which takes air inputs from both the rooms. 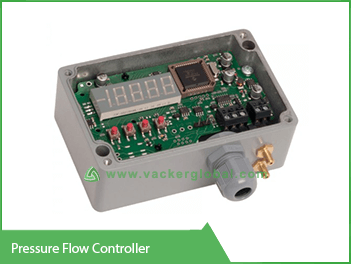 This central control unit is the major component of the differential pressure monitoring. There will be one small air pipe connected to the first room and a second air pipe to the second room. This directly represents the pressure of each room. The system comprising of pressure sensors continuously monitors the pressure difference and measures the exact pressure at all times. An absolute pressure sensor is a sensor, which measures the pressure of a single room and displays the exact pressure reading. A basic differential pressure sensor consists of two absolute pressure sensors. Normally, the control unit will be capable of displaying the exact pressure readings of both the rooms as well as the difference in readings. 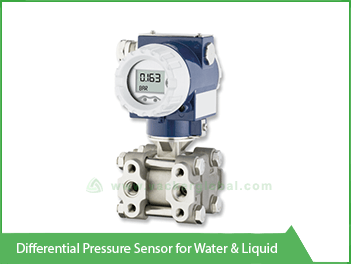 Differential pressure measurement is applicable for air, gas, liquid etc. All of them have the basic principle of measuring the pressure between two points. While mentioning about negative pressure, it is generally lower pressure than atmospheric pressure. Also, it can be lower pressure compared to an adjacent room. In all these cases, it is basically the difference in pressure. As an example, if you have a warehouse with huge exhaust fans it is removing air from the warehouse. If you do not have proper air intake systems the pressure inside the warehouse will become negative. Hence, you should have air intake systems which bring fresh air at the same rate as removal of air. And, both the systems should work simultaneously. If the exhaust fan is not working, the air intake system also should stop simultaneously. Otherwise, the higher intake will generate a positive pressure inside the warehouse. A negative pressure sensor constantly checks whether the pressure is becoming negative. Positive pressure and negative pressure sensors are two elements of the same differential pressure monitoring system. In the above example, you need to ensure that the pressure does not become positive nor negative. In this case, you do not need a separate positive pressure sensor and another negative pressure sensor. 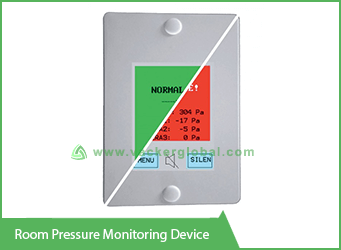 You will require one room pressure monitoring system having two air pipes. One pipe will be positioned inside the warehouse and the second one outside the warehouse. We can program the same to ensure that the inside pressure is always same as outside pressure. In hospitals, there are a lot of critical areas such as operation theaters, isolation wards, critical care units, laboratories etc. We need to maintain pressure difference for such rooms. This require continuous room pressure monitoring systems. Major use in hospitals is for isolation wards, which maintain a slightly lower pressure than the surrounding rooms. As this room has a lower pressure, contaminated room will not go out of the room. This will mainly prevent the spread of airborne diseases. Air will flow from the outside into this room, but not reverse. As this is a very critical requirement, our reliable negative room pressure monitoring can be installed for this purpose. We will install one air pipe in the isolated room and another one outside this room. This monitors that the isolated room always have a negative pressure. Similarly, there are positive pressure rooms in hospitals which will provide a clean environment. These rooms are for sterile equipment, for patients with low body resistance etc. 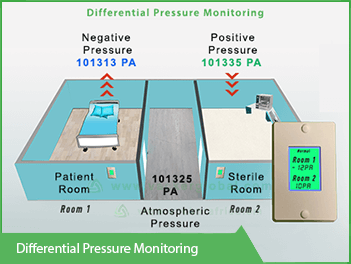 In this case we use the term positive room pressure monitoring system. Also, all the Central sterile supply department (CSSD) areas in hospitals will require differential pressure monitoring systems. The isolation rooms are at negative pressure so that air does not go out of the room spreading diseases to other areas of a hospital. For such applications, a hospital requires differential pressure sensors. In this case, we call it simply as isolation room sensor. But the device is exactly same without any technical difference. The device will continuously monitor the room inside the isolation room and pressure outside the room. If the pressure inside the isolation room is lesser than that outside, it is safe. Otherwise, the sensors will make alerts such as audible alarm, telephone call etc. using auxiliary systems. 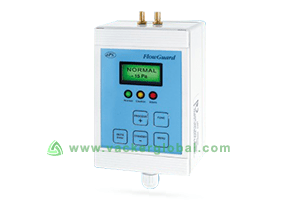 We supply our model 6000 room pressure monitoring system for all commercial applications. You can use the same system for negative pressure monitoring and positive pressure monitoring. You can always adjust the desired pressure level in the configuration. This way you don’t have to worry about the pressure reading before installation. After the installation, you can configure as required by you. One device can monitor up to 4 rooms simultaneously. Also, you can expand the same system using additional subunits. It uses sealed membrane capacitive measurement technology for better accuracy. This will prevent any air particles or dust from escaping from one room to another. The system can generate alerts if the programmed pressure is not maintained. If you require monitoring on your computer through your local area network, same is possible. Also, the system can work as a standalone unit without connecting to a centralized network. We can connect an external alarm to a nursing station or another remote room. Also, the customer can connect a SIM card based phone call and SMS alert system. In this case, it will generate phone calls to 4 operators in case of an alert. The system will display green if everything is OK. In case of an alert, it will display red on the screen. The customer can mount on the surface of the wall. Alternatively, customer can flush mount the same after making a cavity. The display screen is touch screen having dimension of 65 x 50mm. We can connect many devices together to a network through Modbus protocol. The measurement unit is Pascal. The room pressure monitoring system has an accuracy of 0.5 Pa. The dimension of the unit is 150x100x5 mm. We can connect one analog output of the monitoring system to a VAV system for controlling the air flow. How to select differential pressure sensor to suit your application? Choosing differential pressure sensor can be very confusing for general people as it requires knowledge and experience to know what kind of differential pressure sensor you require. Generally, differential pressure sensors can be categorized into three divisions on the basis of media compatibility. The three types of differential pressure sensor are wet/wet, wet/dry and dry/dry. If the medium on the both sides of the sensor is liquid then this type of sensor is suitable to be installed. These differential pressure sensors are generally more expensive than other types of sensors. These sensors are also larger in size. These types of sensors don’t have wide range of sensing capability when it comes to monitoring low pressure but they can monitor higher pressure more effectively. 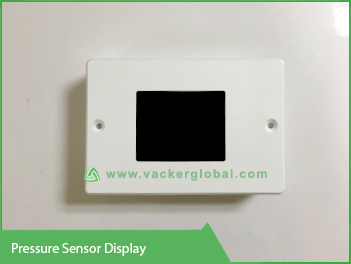 If the medium on one of the side of the sensor is wet and the other side is low then this type of sensor is suitable to be installed. These pressure sensors cost less than the wet/wet sensors. Their capability is also limited like wet/wet pressure sensor when it comes to range of negative pressure sensing. If the medium on the both sides of the pressure sensor is dry then this type of sensor is suitable to be installed. These pressure sensors are not considered to be appropriate for liquids. These sensors cost relatively lower than the wet/wet pressure sensors. While choosing the differential pressure sensor one also should consider the line pressure of the system. A line pressure of a system is defined as the total positive pressure of the system. While selecting a differential pressure sensor the buyer must ensure that the sensor can withstand the line pressure otherwise the sensor can cease working due to high pressure. Customer also, should confirm the accuracy of the sensor during their purchase. It is better to look for ISO standardized sensors for better quality. The time period of warranty by the company while purchasing is another thing to look for. The accuracy of the differential pressure sensor is immaculate. These devices have been tested many times under working environment before it reaches the customers. Also all our pressure sensors come with the warranty of our company. Contact us right now for expert advice and high quality pressure sensors. 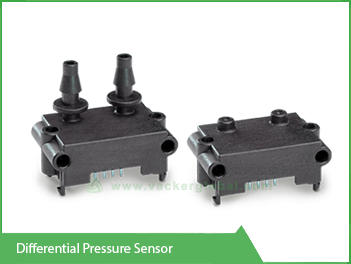 Vacker Global is one of the leading suppliers of differential pressure sensors in the world with its products found in many African nations and Middle East. Negative pressure room is generally used in many hospitals and medical centers to reduce the chances of contamination from one room to another. In a negative pressure room the air pressure in the room is always maintained lower than the atmospheric pressure or from the adjacent environment. Negative pressure in the room is maintained through a ventilation system. The ventilation system in the room is designed in such a way that air from the ambient environment can enter the room but is prevented to flow out as the contaminated air from the room can affect other rooms. The ventilation system in the room continuously forces out the internal air from the room to a certain destination to create negative pressure in the room. These types of rooms are generally used for the patients that are suffering from airborne communicable diseases. Negative pressure room is very important for hospitals to protect the working staff and other patients in the hospital from getting the disease spread out. Many people visit hospitals every day, negative pressure rooms helps to stop spreading of airborne diseases from spreading out to those people from the patients in the hospital. These negative pressure rooms are more important for people having weaker immune system such as babies and old people. People suffering from diseases like measles, tuberculosis, chicken pox etc. are kept in a negative pressure room. These diseases can easily be transferred from the air. Negative pressure rooms stop the spreading out of harmful germs such as yeasts, bacteria, viruses, fungi etc. other parts of the room. The negative pressuring is generally used in isolation rooms. This helps the hospitals or medical centers to be safer place for patients and staffs. Some of the rooms that need to be negatively pressurized are emergency waiting room, dark rooms, autopsy rooms, restrooms, isolation rooms for patients suffering from airborne disease, microbiology laboratories, pathology, sterilizing laboratories, decontamination room and many more. Hence, this shows that there is a huge importance of negative pressure rooms in health care and medical centers. In fact without negative pressure rooms, hospitals will be dangerous place for the people as instead of getting well from the disease from the hospital it is more likely that the patient will get infected by more diseases. Hence the code for health care centers strictly wants hospitals and health centers to have negative pressure rooms. Positive pressure rooms are adjacent opposite of negative pressure rooms. 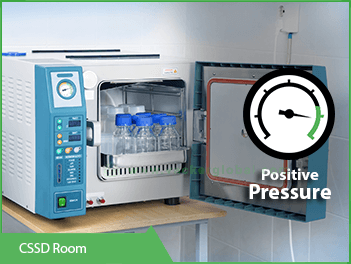 In a negative pressure rooms the room has lower air pressure than its ambient environment but in a positive pressure room the room has higher air pressure than its ambient environment. In a negative pressure room the ventilation system is designed in such a way that the air from the environment can enter the room but the air from the room cannot escape while in positive pressure room the air from the room can escape but air from the environment cannot enter the room. The ventilation of the positive pressure room consists of fans or filters. These fans or filters help to create high air pressure by blowing air into the room. It creates positive air pressure inside the room and prevents the air from the ambient environment from entering the room. The room must be properly sealed to maintain the positive air pressure in the room. 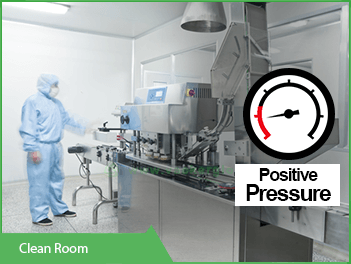 Generally, a positive pressure room is used to prevent contamination from the ambient environment to enter the room. These positive air pressure rooms are used in cleanrooms. They are also used in other sensitive areas such oil platform. 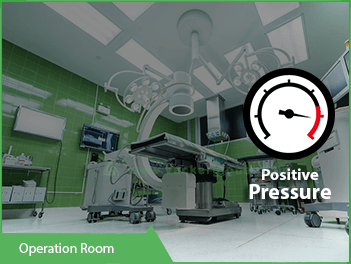 These positive pressure rooms are also widely used in operating theaters. This protects the patient to be protected from infection from external agent during the operation. Hospitals also use positive pressure room to keep patients with weak immune system. These patients can get easily affected by external contamination or pathogens such as bacteria, viruses, fungi etc. Positive pressure rooms helps to keep the environment safer for such type of patients. Another use of positive air pressure rooms in hospitals can be seen in vitro fertilization room. One of the most common uses of positive air pressure is in the cleanrooms. To maintain a clean room the room must be sealed from external air, dirt, dust and other microorganisms. Creating positive air pressure and turning the clean rooms into positive pressure rooms helps to prevent the external agent. Examples of cleanrooms having positive air pressure are pharmaceutical production clean rooms, medical production clean rooms, medical research clean rooms, pharmaceutical research room, chemical laboratory clean rooms, etc. These positive air pressure rooms are also used in cleanrooms that are related to aerospace, optics and electronics. The positive air pressure in such clean rooms helps the user to comply with the required standards of the cleanrooms. When it comes to gases with non-aggressive nature, you can always measure their differential pressure with the help of a differential pressure sensors for gas. The gas should be non-inflammable as well in nature. 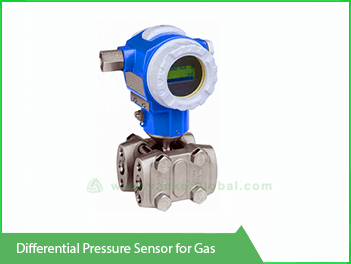 These differential pressure sensors for gas are best suited for measuring the room’s pressure. The can be pretty useful for ensuring the viability of the filters. A room pressure sensor can be of utmost importance, the same can deliver great result if your room is clean. The output signal from a differential pressure sensor for gas can vary anywhere amidst 0 to 10 volts. You might think of usability of these sensors in everyday life. Well, gas sensors can be used in industry segments such as semiconductor, processing, e-commerce, all sorts of packaging industries related to food & product testing industry as well. Accuracy is what makes differential pressure for gas, unique. With an accuracy of over 98%, the results obtained from the same are reliable. You can obtain an array of features apart from the accuracy, you can get a compact design, you might also leverage the energy saving amenities of the gas sensors as well. Let’s talk about the pressure handling of differential pressure for gas. Generally, a proficient gas sensor can handle as high as 20 kPa of pressure. The number is the threshold level of the sensor for its pressure taking capability. When it comes to maintenance & installation of these, they are pretty easy to install. With added flexibility, pressure sensors can be your best pick if you’re looking forward to enjoying a quick installation. Just like plug and play, you can install your differential pressure for gas in minutes. Compact design is what makes them rigid, you may also have a gas sensor with digital display. You can leverage the display feature for the purpose of obtaining values of pressure transmission as well as differential pressure in real-time. These differential pressure can ensure the user with reliable results & strong appeal. An HVAC system, when combined with a proficient Differential pressure, can lead to a thriving combination. HVAC systems aren’t that good to cater the maintenance as well as security needs of today’s buildings. The growing demand aims for new solutions; the prime goal is to keep occupants of the buildings or offices safe. A great deal of security can be obtained by leveraging the potential of the HVAC- Differential pressure sensor combo. An array of applications come handy for the purpose of installing an HVAC- Differential pressure sensor system, you can utilize them for keeping a check on the indoor air’s quality level. Keep your loved ones safe by letting them breathe fine air, monitor air quality with the help of Differential pressure sensors for HVAC systems now. It is obvious that buildings must have a way for air to initiate an airflow. Measure the desired data with added ease by the aid of the pressure sensors combined with your HVAC system. When it comes to quality, a differential pressure sensor for HVAC system never jeopardizes the user. When it comes to any sorts of quandary or sudden change in air pressure, the pressure sensor informs the user at ease. Measuring the air pressure amongst your room is what differential pressure sensors for HVAC systems are best at. What comes a great fact is that you can utilize the benefits of the technology and can deploy room pressure sensors for hospitals as well. Get instant updates when the filters require a clean-up. Stairwell pressurization is dealt with much perfection by Differential pressure for HVAC systems. One of the most exquisite applications of differential pressure sensors for water & liquid is measuring the pressure in the sealed tanks. The theory behind the application is pretty gaudy, Differential pressure sensors for water & liquid can be a saviour. Do you know that a sealed tank contains an invisible layer of atmospheric gas over the liquid contained in the tank? Well, this layer of gas has a pressure which has been termed as vapour pressure. There is this hydrostatic pressure in the bottom of the tank which is due to the effect of standing water. When combined, these two creates problems for pressure measuring gauges. The resultant of hydrostatic & vapour pressure fluctuate the measuring needles, which in turn results in not so accurate differential pressure readings. This menace has failed pressure gauges to a great extent. Well, with the advancement of technology, differential pressure sensors for water & liquid can be your best pick for measuring the pressure of sealed tanks. The correct pressure of the tanks can be obtained by the same. Another vital application can be using a pressure sensor with injection wells. This is done to calculate the difference in the pressure values of reservoir & foot holes. Measure the pressure of injection pressure and that of reservoir pressure with added ease through the aid of differential pressure sensors for water & liquid. Do you know when it comes to calculating the liquid’s flow in a pipe, the diameter of the pipe might cause a bit problem. To overcome this, an orifice plate is used from the inside, this reduces the path of the liquid stream. Differential pressure sensors for water & liquid measure the liquid’s pressure at the orifice plate’s left slant as well as right slant and then calculates the differential pressure of the stream. There are mainly three designs for pressure sensors for liquids out there in the market. For the best measurement and computation of water stream’s pressure, you can make use of a piston-style pressure sensor. The same can be your best pick for measuring the differential pressure if water is clean. Piston type pressure sensors can measure the pressure in liquids with a low differential pressure. Another type of pressure sensor for liquid and water is a welded sensor, this type of sensor is a packed one. Best suited for higher temperatures, volatile environment involving a lot of pulsation, you can leverage the capabilities of an all-welded pressure sensor. The third one in the array of differential pressure for water & liquid is the double-style diaphragm sensor. When it comes to measuring the differential pressure of high-pressure environment locked with low-differential pressure, then double-diaphragm sensors with a pressure accommodation range of over 3600 psi can be your out of the box pick. All models are available with Inch Specification subject to change without notice. *Other ranges and options available, all sensors have a number of sub settings depending on main range. User can specify new ranges when ordering.